Adam J. Fernandez is an experienced trial lawyer who focuses his practice on representing clients injured as a result of motor vehicle/commercial vehicle/trucking accidents, medical malpractice, nursing home and assisted living facility negligence, defective/unsafe products, and trip/slip hazards. Adam also devotes a large portion of his practice to litigating first party insurance claims against insurance carriers that have wrongfully denied insurance coverage. Mr. Fernandez began his career in 2008 as an associate with Tampa Bay area firm practicing commercial litigation. 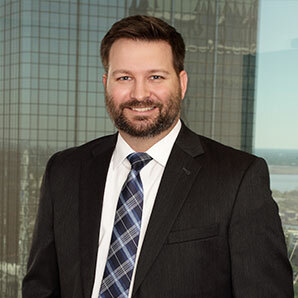 In 2010, Adam accepted a position as a criminal prosecutor with the State Attorney’s Office for the 13th Judicial Circuit in Hillsborough County. During his career as a prosecutor in Tampa, Mr. Fernandez gained significant jury trial experience and successfully prosecuted well over a thousand misdemeanor and felony cases, many of which involved serious injury to the victim. In 2012, Adam transitioned from criminal prosecution to plaintiff’s civil trial law and has since gained the respect of both his peers and members of the judiciary in the field of personal injury, earning an AV Preeminent Rating by Martindale Hubbell, the highest rating an attorney can obtain in the areas of legal ability and ethical standards. He has also been honored as a Super Lawyer Rising Star in 2015, 2016, 2017, and 2018. Since 2015, Adam has continued to serve on the Board of Directors of the Hillsborough County Bar Association, Young Lawyers Division. Selected to Super Lawyer Rising Stars 2015, 2016,2017 and 2018. Rated AV Preeminent by Martindale Hubbell, the highest rating an attorney can obtain in the areas of legal ability and ethical standards. Hillsborough County Bar Association, Young Lawyers Division, Board of Directors, 2015-Present. Hillsborough County Bar Association, Young Lawyers Division; Chairman, Professionalism and Ethics Committee, 2015. Hillsborough County Bar Association Leadership Institute, 2014-2015.